There is a beautiful piece by Catalan/Spanish singer/songwriter Marina Rossell about the habanera, a type of song that has been popular in the Spanish-speaking world for decades for the melancholy and nostalgia associated with it. The most famous habanera ever is La Paloma, recorded by dozens of singers, including Beniamino Gigli, Hans Albers, Bing Crosby, Elvis and Julio Iglesias. 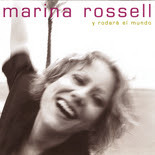 Marina Rossell's habanera is called de qué hablas habanera and is on the CD y rodará el mundo. on the margins of war. I discovered the song – and singer – on emusic, an MP3 music site I can highly recommend. Some of Marina Rossell's CDs are available through Amazon. Mr. Blumfeld, etc., let me know that now he has a blog of his own, called World So Wide. Why should I produce series? Doesn’t anyone like variety? OK, now he's back to Brownfeld, as per specific instruction. Have it your way, Blumstein, Brownstein, Goldblum, whoever you are.